Santa Fe hiking trails offer unique altitudes and terrains, making it a great destination for expert and novice hikers alike. From sandy and rocky ground to pine and aspen forests, the landscape varies drastically. You will see snowy peaks, ancient rock formations, and historic petroglyphs along these Santa Fe hiking trails. Enjoy your adventure! The Atalaya Mountain Trail is a 6-mile out and back trail featuring a lush forest setting. This heavily trafficked trail is ideal for all skill levels, though geared more toward a moderate level, and is primarily used for hiking and walking. Beautiful views and snowy peaks await expedition. Dogs are allowed as well as long as they are kept on leash. There are over 25 miles of trails in the La Tierra Trail Network. These trails are used for hiking, walking, biking, and horseback riding, and your dog is allowed with a leash. This multi-use trail system in northwest Santa Fe features lots of sand and rocks, and the outer loop is more challenging. The La Piedra Trail hosts 3 miles of recreational public trails that connect the Dale Ball Trail North with the Little Tesuque Creek Trail. This link allows hikers to enjoy lengthy views of the Tesuque Valley along with shaded pine forests and cool, bubbling creeks. Crossing through the Santa Fe National Forest and along the Sangre de Cristo Mountains, this trail is a thrilling experience. The Randall Davey Audubon Center offers some truly wonderful Santa Fe hiking trails with a variety of wildlife and landscapes. Here, you’ll find 135 acres of striking natural features and creatures bordering the National Forest and Santa Fe River Watershed. Over 190 species of birds can be found in this sanctuary, making it an ideal location for birdwatching. The Petroglyph National Monument also hosts some great Santa Fe hiking trails, and these feature leftover remains from a long-gone era. The petroglyphs are enough to wonder at, carved crudely into volcanic rocks. One trail system within this national monument is the Boca Negra Canyon Trail System, where over 100 petroglyphs can be viewed within just an hour of walking. Ghost Ranch is a must-see location with a series of fascinating Santa Fe hiking trails. A 5-mile difficult trail that includes a 15-foot chimney through a cleft in the cliff is the Kitchen Mesa Trail. 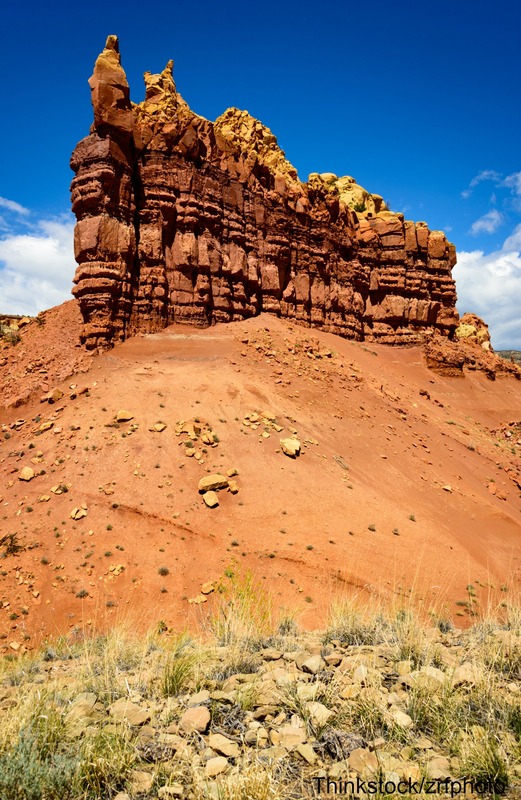 The 3-4 hour trek will take you from 6,500 to 7,100 feet, ascending up the Entrada Cliffs. The Kasha-Katuwe Tent Rocks National Monument is an outdoor laboratory, offering opportunities for observation, study, and geological experience. Located on the Pajarito Plateau, the national recreation trail ranges from 5,570 feet to 6,760 feet above sea level. Two segments of this trail provide hiking, birdwatching, observation, and plant identification opportunities. The highlights along the parth are the cone-shaped tent rock formations that were caused by volcanic eruptions that occurred over 6-7 million years ago. The Tsankawi Ruin Trail is one of the best Santa Fe hiking trails near the Bandelier National Monument. This 2.5-mile loop is accessible throughout the year, though there are some obstacles along the pathway. This trail is not for the beginner, though parts of it are fairly easy stretches. You will have to climb two Kiva Ladders, weather the rocky terrain comprised of tuff (compressed volcanic ash), and brave some sandstone. After experiencing these Santa Fe hiking trails, you will want to relax your aching muscles. 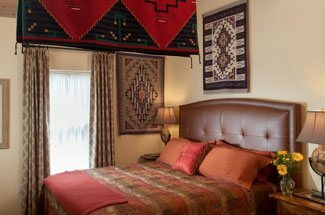 Come back to Four Kachinas, and sink into our cozy beds for a well-deserved nap. Then, wake up to enjoy some dinner and nightlife that the city has to offer! 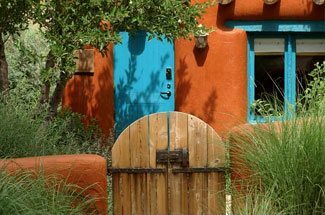 For more to do in Santa Fe, download our free vacation guide!